There are few things we love more at WSS than getting the official soccer gear for a team we've never had before. Official Lotto Queens Park Rangers Football Club 09/10 Home Soccer Jersey! 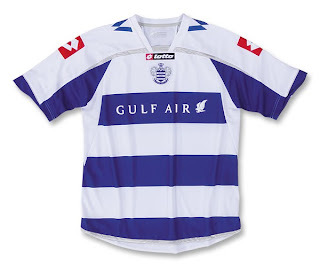 The new home jersey retains the traditional hoops in reflex blue and white, but this year, the Lotto Sport Italia logo is at the top center of the chest, with the QPR Club Crest situated half an inch below. The Gulf Air logo is now placed within the blue hoops. QPR was formed in 1882, when a team known as St Jude's merged with Christchurch Rangers. The new team was called Queens Park Rangers, because most of the players came from the Queen's Park area of North-West London. QPR became a professional team in 1889 and played their home games in nearly 20 different stadia (or stadiums) (a league record), before permanently settling at Loftus Road in 1917.